Ordinary Americans often bring family and neighborhood problems to court, seeking justice or revenge. The litigants in these local squabbles encounter law at its boundaries in the corridors of busy city courthouses, in the offices of court clerks, and in the church parlors used by mediation programs. Getting Justice and Getting Even concerns the legal consciousness of working class Americans and their experiences with court and mediation. 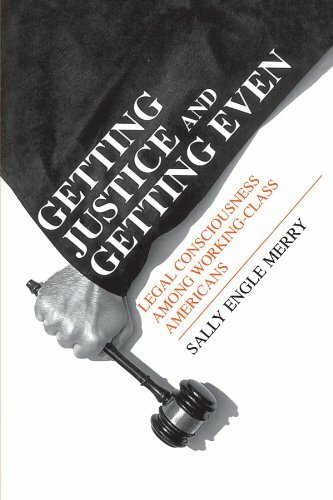 Following cases into and through the courts, Sally Engle Merry provides an ethnographic study of local law and of the people who use it in a New England city. The litigants, primarily white, native-born, and working class, go to court because as part of mainstream America they feel entitled to use its legal system. Although neither powerful nor highly educated, they expect the law's support when they face intolerable infringements of their rights, privacy, and safety. Yet as personal problems enter the legal system and move through mediation sessions, clerk's hearings, and prosecutor's conferences, the citizen plaintiff rapidly loses control of the process. Court officials and mediators interpret and characterize the meaning of these experiences, reframing and categorizing them in different discourses. Some plaintiffs yield to these interpretations, but others resist, struggling to assert their own version of the problem. Ultimately, Merry exposes the paradox of legal entitlement. While going to court allows an individual to dominate domestic relationships, the litigant must increasingly yield control of the situation to the court that supplies that power.